A Union of Concerned Scientists (UCS) analysis released today highlights the significant health risks posed to military families and communities by a class of synthetic chemicals found in firefighting foam, nonstick cookware and other products. Per- and polyfluoroalkyl substances (PFAS) are long-lasting compounds known to accumulate in the human body and environment, including water supplies. Exposure to these chemicals is associated with a range of detrimental health effects including kidney and testicular cancer, liver damage, and decreased immunological response. Military installations and adjacent communities are especially at risk because the sites use PFAS-containing firefighting foam in their trainings and operations. These chemicals have seeped into the ground and waterways near military sites, and in turn contaminated groundwater and the drinking water that serves the bases and nearby homes. In light of a new scientific assessment by the Agency for Toxic Substances and Disease Registry (ATSDR), an office within the U.S. Department of Health and Human Services, UCS found that the threats facing military families and nearby communities is worse than previously thought. The ATSDR draft report suggests that the safe level of PFAS in drinking water should be seven to 10 times lower than the current, non-enforceable federal guidelines set by the Environmental Protection Agency (EPA). 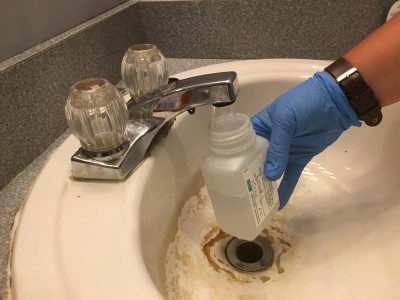 This means that thousands of families living on or near current or former military installations face potential risks from levels of PFAS once deemed safe, and some might not even know it. The draft ATSDR report is the same one that political appointees within the Trump Administration attempted to suppress. In documents obtained through a Freedom of Information Act request by UCS, one White House official called the ATSDR draft a potential “public relations nightmare.” It was only after a robust public outcry and bipartisan congressional oversight that the assessment was finally released. Of the 32 sites with direct drinking water contamination, more than half had PFAS concentrations that were at least 10 times higher than the risk level established by the ATSDR. More than 90 percent of the military sites, 118, had PFAS concentrations at least 10 times higher than the threshold identified by the ATSDR report. Nearly two-thirds of the sites, 87, had PFAS concentrations at least 100 times higher than the risk level identified in the ATSDR report. The ten sites with the highest detected PFAS levels in groundwater include bases in California, Florida, Delaware, Virginia and Texas, as well as former base sites in Louisiana, South Carolina and Illinois. These sites have PFAS levels in groundwater more than 100,000 times higher than the suggested threshold. The number of military sites with PFAS contamination is likely even higher since the Pentagon used the EPA’s drinking water health advisory of 70 ppt as the PFAS detection level and only tested for the two most common compounds.